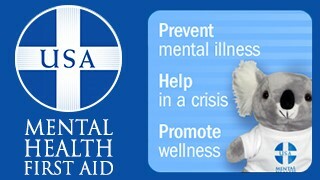 Increase awareness of mental health issues among school-aged youth. Provide training for school personnel, families, and community members to detect and respond to mental health issues in children and young adults. Connect youth and families with needed services. Staff and community members are important participants in the development of safe and healthy environments for youth. Project AWARE provides opportunities for community members and staff to participate in Youth Mental Health First Aid, a training designed to teach caring citizens how to help youth who are experiencing a mental health or addictions challenge or are in crisis. Register for YMHFA training here.